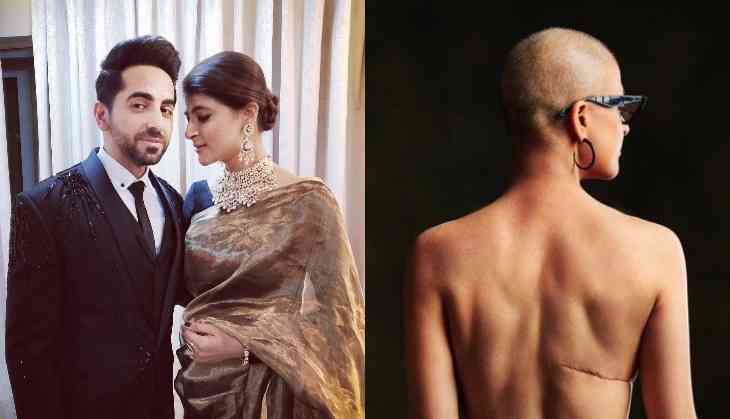 Home » Bollywood News » On World Cancer Day, Ayushmann Khurrana shares the most heart wrenching picture of his wife Tahira Kashyap! Bollywood actor Ayushmann Khurrana's wife Tahira Kashyap is fighting against the big disease Tahira Kashyap. Ayushmann's wife Tahira got to know about her disease in the checkup that she is being diagnosed with pre-breast cancer and for that, she also went through a mastectomy. During this therapy that doctors actually removes the breast from the body. Today while on the occasion of world cancer day, actor Ayushmann Khurrana shared one picture of Tahira that will really melt your hearts for the actor and his wife. Ayushmann shared a picture of Tahira from the backside and she is bald in the picture. The picture also shows a scar on the back side of Tahira. Ayushmann Khurrana shared the picture with a caption, "Paa le tu aisi Fateh. Samandar teri pyaas se darey. These lines are for you @tahirakashyap. Your scars are beautiful. You are a trailblazer. Keep inspiring the millions to fight their toughest personal battles. Be the lifer you are! #worldcancerday"
Let us tell you that in an interview, once Ayushmann Khurrana revealed that the past October month in 2018 has really turned a surprise for him. He told that he got the best films of his career, AndhaDhun and Badhaai Ho in the same month, and also got to know the worst news of his life about his wife's cancer.